Following Escape Camp 14 with Ruthless was a fairly easy transition. The work camps of North Korea have eerie similarities with the SeaOrg work conditions within Scientology. Miscavige makes the association, lumping in Nazi Germany, himself. Ron Miscavige, father of cult leader David Miscagive, left the Church of Scientology in 2012 after 40 decades involvement including 27 years in the SeaOrg. He brought his family, including teenage son David, into the fold and devoted his life to the “church” included traveling to England for classes. At sixteen David left what meager schooling he was still attending to join to SeaOrg full time. David managed to get into L. Ron Hubbard’s good graces as a “messenger” and after L. Ron’s death in the mid-eighties, and a brief power struggle, David took his place as the Chairman of the Board of Scientology. Around this time, Ron Miscavige joined the SeaOrg himself, as a musician and moved to the Gold Base. At first things were fine, he was playing music and married his second wife but as David gained more power things at SeaOrg became more unbearable. Members would go days without sleeping to finish projects for David only to be berated when their sleep deprived brains didn’t produce perfect results. The living conditions were poor; and verbal abuse, food restrictions, phone & mail monitoring and other terrorizing tactics increased as the years passed. 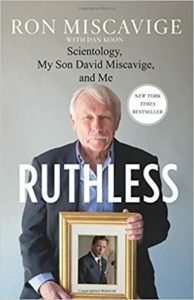 Miscavige gives several first hand horror stories about the abuses his son inflicted on other people, including his own family, and a few second hand stories he trusts to be true. Like Leah Remini’s memoir the stories are horrifying. Miscavige is honest about himself and his flaws, particularly involving his first marriage, but his overall writing style is a bit self serving. While Miscavige can denounce his own son, the punishments he enforces and his treatment of his staff, he still believes in some of the basic Scientology principles. He takes pains to show the differences between L. Ron Hubbard and David Miscavige’s leadership of the church because he never took issue with Hubbard’s leadership. The living and work conditions eventually took their toll and, after a few years of talking about it and several months planning it, Ron and his wife escaped the SeaOrg compound. After a few weeks hiding out at his in-laws’ Ron was visited by two members of the Church who tried to get him to come back. While he ignored their requests they stayed in town for a month, which Ron attributed to a fear of what David would say about their failure. Ron hasn’t made amends with his son but he did accept $100,000 from David about a year after leaving the Church. Ron had appealed to his son, since he never made more than a few dollars a week that he had no savings and no Social Security, for help buying a house. Ron was then told by police that he had been followed by two private investigators for the last eighteen months. These investigators were hired by the Church of Scientology and told by David Miscavige not to interfere in Ron’s life. Including one instance when they thought he was having a heart attack! Scientology is a cult. It’s always been a cult. And more stories like this from survivors, even imperfect ones who still feel some nostalgia for when it was a cult they felt safe in, are important. Share the post "Absolute Power Corrupts Absolutely"
Does the book give any insight into the origins or early warning signs of David Miscavige’s desire for power or willingness to be despotic? He makes no excuses for his son though. He calls him a sociopath.